The John F. Kennedy Presidential Library & Museum is virtually re-enacting the Apollo 11 mission to the moon. 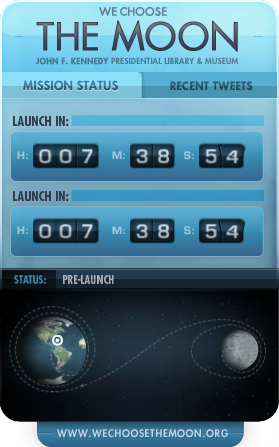 They have put together an incredible web application that will take us from launch to the actual landing on the moon in real time. They will even be making twitter updates as historical events occurred throughout the re-enactment. I for one am really looking forward to this and even plan to wake up for the official launch in a few hours. Having been born nearly 20 years after this event, I missed out on the excitement of the times, so I’m thrilled that this has been organized. Not only does it appeal to the younger generation, but it also brings back nostalgia for those that remember this historic time period as if it were yesterday (or so I’m told). So head on over to http://wechoosethemoon.org.